Classic roasted duck with apples recipe. The duck is stuffed with apples and herbs. It’s my family recipe so it‘s trusted and simple. The meat is very juicy and aromatic, it falls off the bone easily. Duck breasts are particularly delicious here, they are so tender that you can cut them with a fork! Truly amazing. 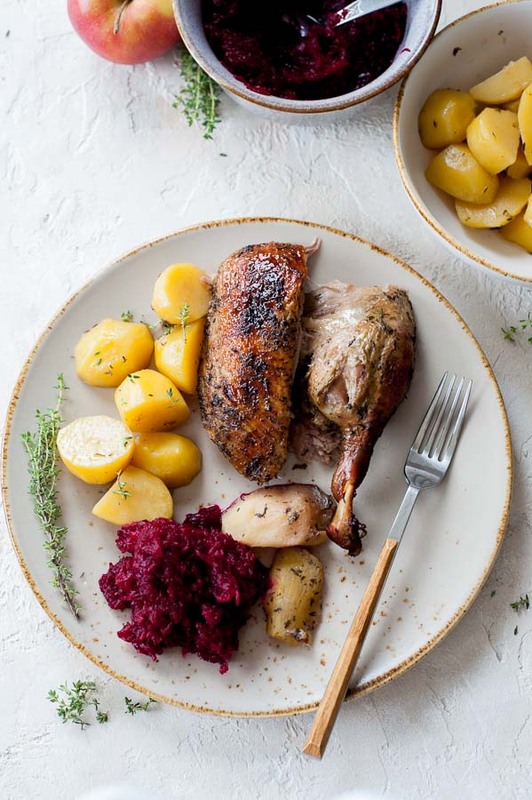 Roast apple duck is a traditional Polish dish and my family recipe. It’s the most common way of duck preparation in Poland. It’s often served during holidays (Easter, Christmas) and any other important gatherings. What makes it polish is stuffing the duck with apples and seasoning it with marjoram. – The duck, obviously! Most ready-to-roast duck weigh 4-5 lb (1.8-2.2 kg). If you buy a frozen duck, it’s important to thaw it in the refrigerator for a minimum of 24 hours, overnight is not enough. Even if a duck has been left in the fridge overnight and appears to be thawed from the outside, it’s usually still partially frozen on the inside. Most often the neck and giblets are inserted into the duck cavity and it‘s really hard to remove them if the duck is not completely thawed. – Spices: I use thyme, marjoram, and lovage. They go with duck very well. You could also use rosemary or tarragon. At the end I also brush the skin with a bit of honey – it browns nicely. – Roast duck stuffing: In this recipe, I stuffed the duck with apples, ½ lemon, and herbs. You could also add dried cranberries. It’s important to choose a firm apple variety. They‘re being roasted, together with the duck for 2.5h. Soft apple variety will turn into mush after this time. How to roast a duck? Roasting a whole duck is really very simple! – Rub the duck with salt, pepper, and spices and leave it in the fridge for at least overnight or better for the whole day. This is the most important step of the recipe. – Roast the duck, first, at high temperature (450°F / 230°C), breast-side down. This makes rendering the fat easier, ducks have a lot of fat, especially on the breasts. – Then cover the baking dish, reduce the temperature (350°F / 180°C) and bake for 2 hours. Some recipes call for spooning the duck with the rendered juices every 30 minutes or so. I find that not necessary and this preparation method doesn’t require it. Also, each time you open the oven, the temperature of the oven drops by about 30 degrees. – Total duck roasting time is 2h 30 mins. 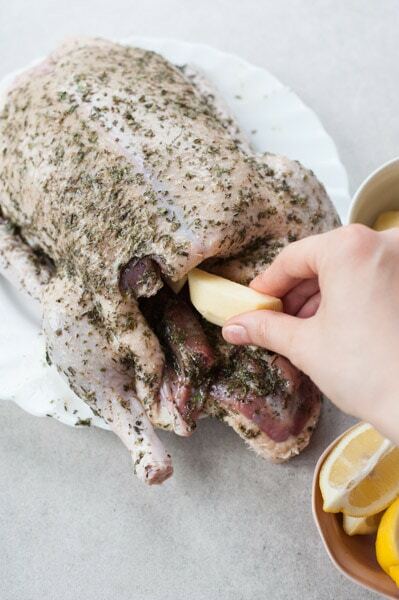 – When the duck is done, it’s important to let it rest after cooking, before carving into servings. The duck should stay in the baking dish, in the rendered liquid, it will soak up the juices while cooling down, resulting in even juicier meat! (source: Harold McGee’s book). – Some recipes also call for placing the duck in the baking dish on a wire rack with rendered fat gathering under the duck. You could also do that, but I prefer when my duck is roasting in all those juices. Brining the duck is a must, in my opinion. 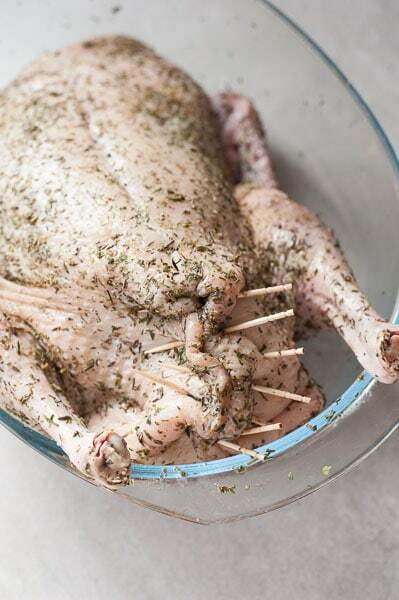 You brine the duck, just as you would brine a turkey. Without this step, the meat can be tough and dry. I’m a fan of dry brining, even if wet brining of a duck is not so problematic as with the turkey. – Storage of a dry duck in a refrigerator, as opposed to a container filled with water, is far more convenient. – Dry brined meat tastes better in my opinion, its taste is more concentrated. Wet brined duck meat is for me more watery and mushy. How much salt do you need to dry brine a duck? For a 4.5 lb / 2 kg bird I’m using about 2.5 teaspoons of table salt. 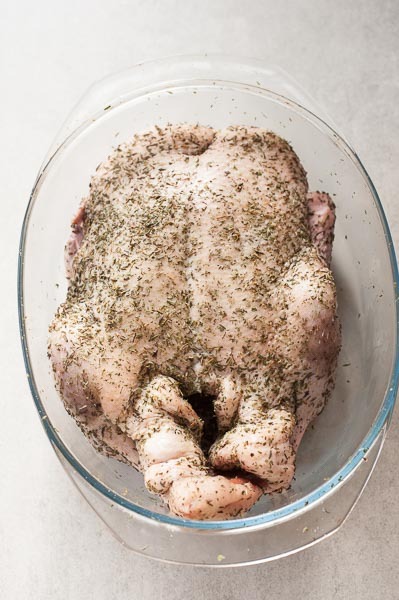 Rub the duck with salt and spices on the outside, inside and additionally, loosen the skin from the breasts (without totally detaching it) and rub the breast meat. 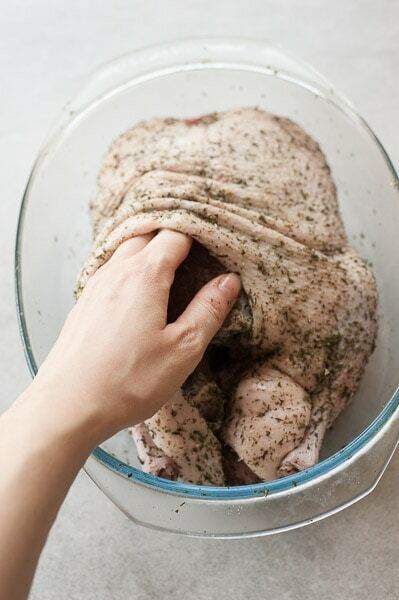 Normally, if you rub chicken’ or turkey’ skin with salt, it has the ability to go through the skin and reach the meat. Duck skin is very thick though, with a layer of fat underneath. It’s also the most problematic part of the bird so to make sure that it comes out perfect, I rub the meat on the breast also under the skin. I case of the legs, it doesn’t matter. yes, the meat is that tender, you can easily cut it with a fork! How many people serves one roasted duck? Unfortunately, duck does not have much meat, it yields less meat than chicken or turkey. One duck serves usually 2-3 people. It’s 2-3 elegant servings, that you would serve to your guests. We eat 1 leg + ½ breast per person, but some people eat 1 leg + 1 breast. It would also depend on how big the duck is. -Beside 2-3 servings, mentioned above, you’ll have extra pieces of meat around the carcass left. I usually serve this on the next day: I separate the meat from the bones and divide into small pieces (something like ‘pulled duck’), pan fry briefly in duck fat/butter and serve over mashed potatoes (potatoes, a lot of butter, some milk) sprinkled with grated cheese. – Make a duck ragout! Simmer the shredded meat in tomato sauce and serve with pasta. Sprinkle with parmesan cheese. – Leftover duck meat can also be frozen. Defrost it in a refrigerator, then warm up in butter/duck fat. – Don’t throw away the fat, that has been rendered from the duck. Use it to make duck fat potatoes: either pan fry pre-cooked potatoes in the duck fat or toss uncooked potatoes in fat and roast in the oven. – Super important: make a stock from the leftover carcass and bones! It comes out really delicious and aromatic, it can be a base of many soups or sauces, it can also be frozen. I use it to make french onion soup. It tastes amazing, as good as using beef bones stock. How to make roasted duck bone broth? – It could not be simpler. Add the roasted duck carcass, all leftover bones, and skin into a large pot. Add the vegetables (2 carrots, 1 parsley root, a piece of leek, a piece of celeriac, an onion) and the spices: a few black peppercorns, 3 bay leaves, 3 allspice berries, 1 unpeeled clove garlic, 2 small dried mushrooms, a few sprigs of parsley. Peel the vegetables, cut the bigger ones into 2-3 pieces. Cover the bones and vegetables with water, you should add about 2 qt / 2l. You can also add a duck neck if it was put inside the duck. Simmer for about 1.5h, then strain. The broth can be used immediately or frozen. – You can also make roasted duck bone broth, Asian-style – add a piece of fresh ginger, anise star, chopped lemongrass and season with a bit of soy sauce. – You can also serve it with pearl barley. – Beets or braised red cabbage. – Red cabbage, apple and pomegranate slaw. – Gravy – sauce for roast duck can be made from the drippings and fat, collected from the roasting dish (you can find the instructions in the recipe). More duck recipes: I also have a recipe for duck breast with plum sauce. It can be made only on the stovetop or seared on the stovetop and finished in the oven. 1. Rinse the duck in cold water and pat dry. 2. Rub with salt and spices. 3. On breasts also under the skin. 4. Stuff with apple and lemon quarters. 5. Close the cavity with toothpicks. 450F/230C (breast-side down), then 1h at 350F/180C (breast-side up), add the potatoes and bake 1h. 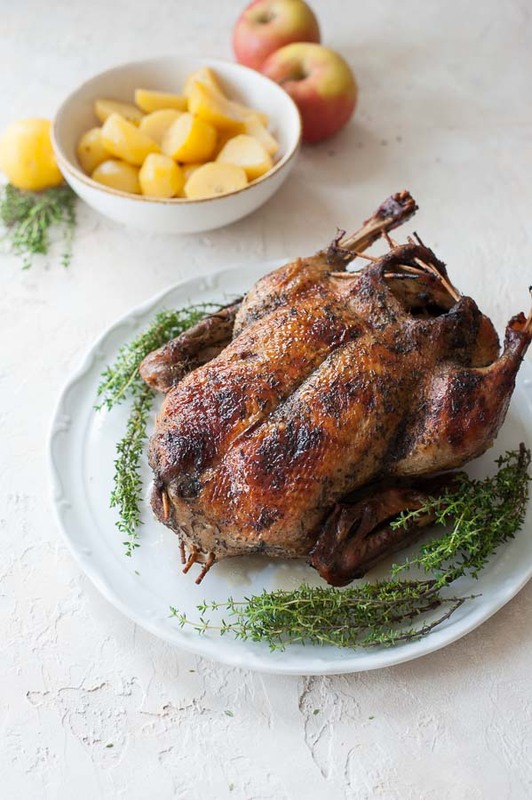 A simple whole roasted duck recipe, stuffed with apples, herbs, and lemon. The meat is juicy, tender and aromatic, falls easily off the bone. The day before: Prepare the duck – remove the giblets and neck from the cavity, rinse the duck in cold water, trim excess fat from the tail. Thoroughly pat dry with paper towels, inside and outside. Rub with salt* and pepper, then with spices. You need to rub it inside, outside, then loosen the skin from the duck breast (without totally detaching it) and rub with the salt and herbs. 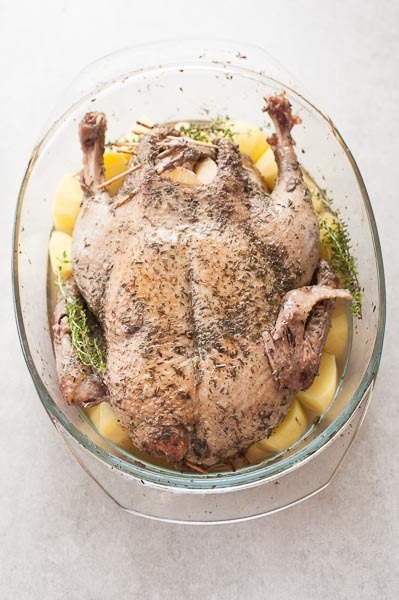 Place the duck in a large dish in the fridge, uncovered, overnight, but better for one whole day. On the day of baking: Take the duck out of the fridge, leave on the counter for 30-60 minutes to warm up. In the meantime, set the oven to 450°F / 230°C / Gas Mark 8, no fan. Cut the lemon in half. Peel and core the apples, cut into quarters. Put inside the duck (as many as fits). Use toothpicks to close the cavity as much as possible, or sew it with a needle and kitchen twine, you can also tie the legs together with kitchen twine (this is optional). If your duck doesn’t have a neck, close this cavity too. Place the duck, breast side down, in a large baking dish (it must be large enough for the duck to fit in). Roast the duck: Put in the oven and bake uncovered for 30 minutes. Then cover the dish with a lid or wrap it tightly with a piece of aluminum foil. Reduce the temperature to 350°F / 180°C / Gas Mark 4, no fan and bake for 1 hour. At the end of this time, start peeling the potatoes and cut them into 1.5-inch / 4 cm pieces. 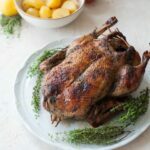 Turn the duck to the other side (breast-side up), lay the potatoes around the duck, you can also add a couple thyme or rosemary sprigs if you have some on hand. Bake, covered, for 1 hour. If you want the skin to be browned and crispy: about 10-15 minutes before the end of the baking time place the duck on the top shelf, uncover and brush the skin with honey. Increase the temperature and roast until browned. Take the duck out of the oven, leave to rest for about 10-15 minutes, it’s best to leave it in the baking dish, it the rendered liquid/fat. 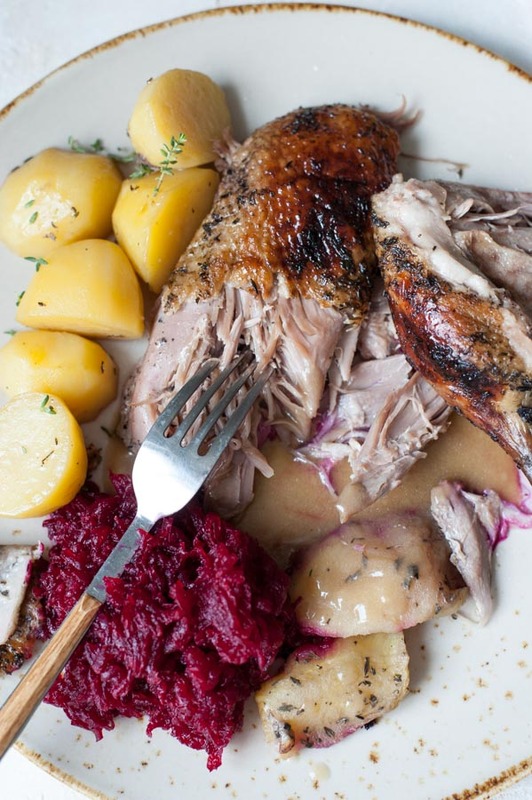 Carve the duck into pieces and serve with roasted potatoes and apples. Sauteed red cabbage or beet salad would be a good side. Gravy: (optional) In the baking dish should remain a lot of liquid, most of this is fat. Try to collect the fat at the top (it’s more clear, reserve it to make duck fat potatoes) and scoop about a ¾ cup of liquid at the bottom (which is more brown, but still, most of it is fat). Pour in a small pot, add 2 teaspoons of flour. Whisk thoroughly and cook for about 3-5 minutes until slightly thickened. Don’t reduce the sauce more or add any additional salt or will be too salty. If you have bought a frozen duck: it should be thawed in the refrigerator for 24 hours, overnight won’t be enough. Even if a duck thawed overnight appears to be thawed from the outside, it’s usually still partially frozen in the inside and it‘s hard to remove the neck and giblets that are most often put there. The amount of salt depends on the weight of the duck: for 4.5 lb / 2 kg bird I use about 2.5-3 teaspoons of table salt. If you have a smaller duck, add a little less, if bigger – a little more. Baking dish: the best would be a heavy cast iron pot with a lid, but every other baking dish will do. If you don‘t have a lid, you can cover the pot with a piece of aluminum foil. It must be big enough for the duck to fit in. The baking time depends on the size of the duck. If your duck weighs 4 lb / 1.8 kg, roast it 10 mins shorter, if 4.8 lbs / 2.2kg about 10-15 minutes longer. Duck stuffing: Dried cranberries would also be a great addition besides apples or you can serve the duck with cranberry jam on the side. Calories count = 1 serving (1/3 duck) + 1/2 potatoes (calculated more or less accurately!). duck is one of the best things ever. i just love roasting a whole duck. i’m a sucker for stuffing it with orange, but am loving the use of apples here. it sounds so incredible!